The Last of Us developer Naughty Dog has stayed quiet on the issue of when its post-apocalyptic title is launching, but Walmart has been taking pre-orders for the game with a Spring release date. The discovery prompted a wave of release date rumours last night, that Sony has now put to bed. See the pre-order material below. The photo was sent to IGN as a reader’s news tip. 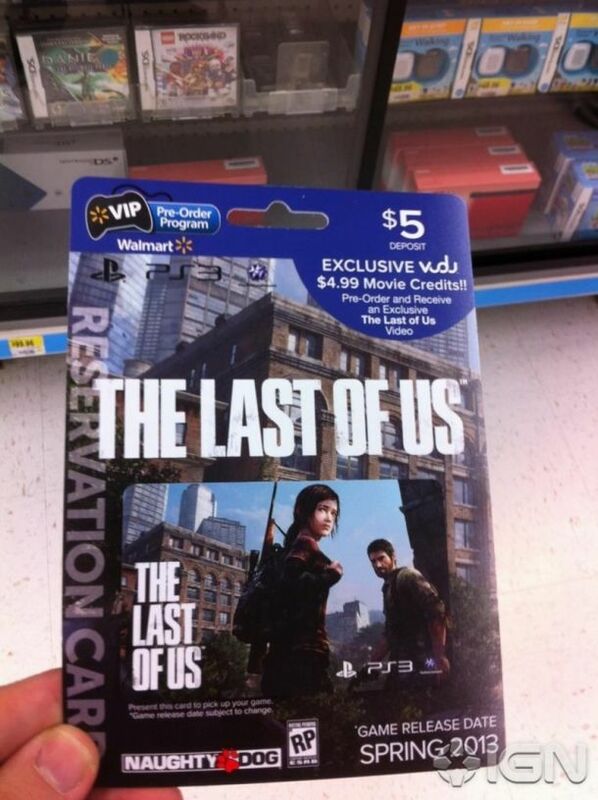 The Walmart pre-order card states ‘Spring 2013’ as the game’s release window, sparking speculation that the game’s release window had narrowed. This kind of thing does – admittedly – happen all the time, but Naughty Dog’s silence regarding release details for The Last of Us has probably been excruciating for some eager gamers, with all eyes on Spike TV’s VGA awards this weekend for a new trailer and fresh information on the game. When do you think The Last of Us will release? Let us know your theories below.